How do our guests describe our BnB’s unique atmosphere? Imagine staying in the house of a friend, with some of the luxury touches of a hotel. Our lovely house, built in 1907 and formally known as The Woodside Hotel, has been a thriving business for over 50 years. We have refurbished this treasure into a light, more modern and serene venue. 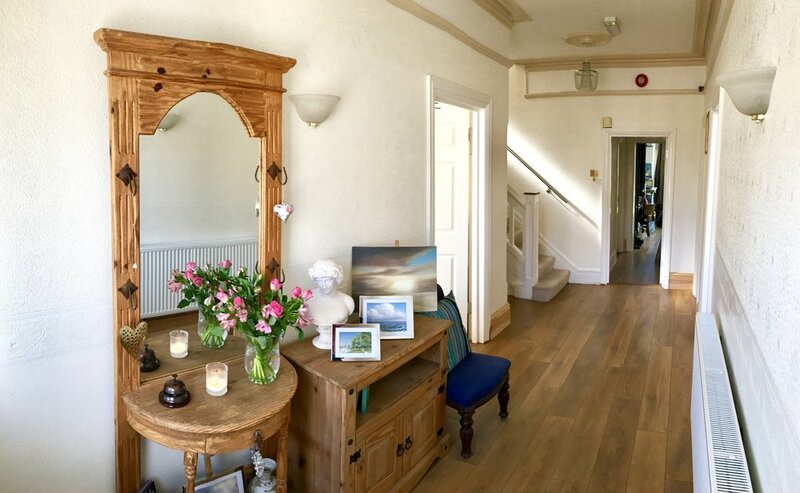 We have three floors, six guest bedrooms, a breakfast room and an art studio. Our breakfast room is open until 9pm, so that you can bring back your own take-out food should you wish. We are located on a quiet tree-lined avenue just a few minutes’ walk from Bournemouth’s stunning cliffs overlooking a panoramic view of seven miles of beautiful sandy beaches stretching from Poole to Hengistbury Head. On a clear day, you can see the shape of ‘The Bear’ made out of the white cliffs of the Isle of Wight, just across the English Channel. After a wonderful night’s sleep, wake up to a choice of delicious homemade breakfasts, all included in the price. Our range of cooked breakfast choices use locally sourced eggs, bacon and sausages, with vegetarian and vegan options. We also serve a selection of cereals, fresh fruit, fruit juices, croissants, tea and coffee. For those with special dietary requirements, we stock gluten-free and dairy-free alternatives. If you have any further dietary needs, please do not hesitate to let us know. 29 Southern Road, Southbourne, Bournemouth, Dorset, BH6 3SR. Three-minute walk to the beach, five-minute walk to Southbourne high street, twenty-minute bus to Bournemouth town centre. Check-In is between 4pm - 7pm (earlier or later check-in by prior arrangement). Delicious high quality breakfast included in the price with vegan and gluten-free options. Dorset handmade luxury toiletries by ‘Love to Be’. Hot drink facilities including a good range of tea and herbal infusions. Freshly filtered and bottled drinking water. Free off-road parking in front of the guesthouse, with additional unrestricted local parking. Bus - Regular buses run from Southbourne Grove to Christchurch, Bournemouth Town Centre, Poole and surrounding areas. Taxi - There are a number of local taxi companies. Numbers available on request. Train - Bournemouth is the main train station for our area, approximately a twenty to thirty-minute bus journey or a fifteen-minute taxi ride. Pokesdown is our nearest local train station approximately a twenty-minute walk away or a short bus journey. Coach - Bournemouth coaches share the site of Bournemouth train station. Many airports in the south of England have coaches directly to Bournemouth. See our access statement below. Our bedrooms are located over three floors. There are hand rails and bannisters to support you up the stairs from the ground floor to the first and second floors. We will always be there to check you in and carry your luggage. When booking, please let us know if you require a first floor room. The house is approximately one hundred years old. 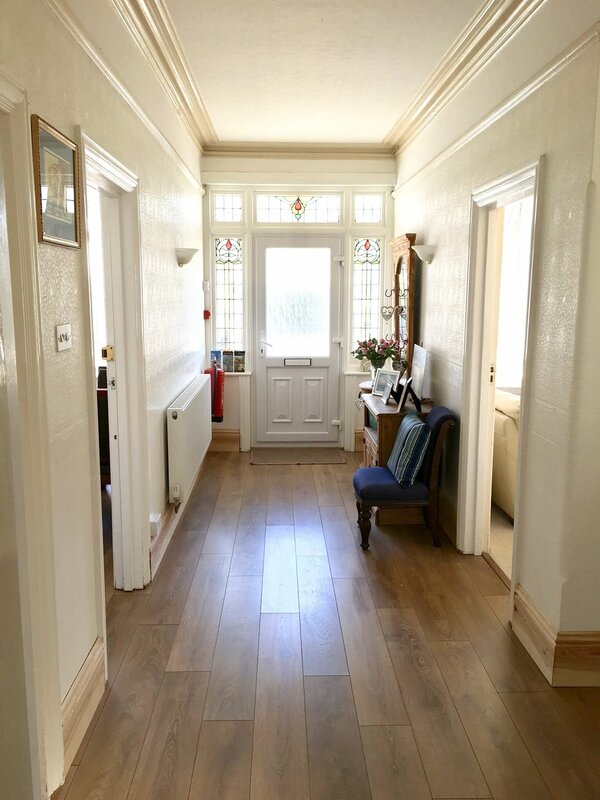 The age of the building means that we are unable to make as many adaptions as we would like, so regrettably it is not accessible for wheelchair users and may not be suitable for all people with limited mobility. Really close to KC Dialysis Centre, Rachel & Martin kindly made us very early breakfasts on dialysis days, and looked after our every need. The first really relaxing holiday we have had in years. Such helpful and welcoming hosts! Their breakfast was amazing and the location was perfect without living on a noisy main road. Very easy to get into the centre of town and to a beach super close by :) would highly recommend. This is a very good Bed & Breakfast, run by Rachel & Martin who cannot do enough to make your stay enjoyable. We have no reservations in recommending it.